1) Ellie is afraid of all water shoes. What? How does this even make sense? I am unclear as to the inner workings of my toddler on this issue, but she WILL. NOT. WEAR. a single pair of water shoes. Not even the cute green crocs I dug up in the mall this weekend. Sigh. 2) We are going to Israel in TWO DAYS and I have barely started packing. Up until now, most of our trips have been road trips. As in "throw everything in the car that you might possibly need, because, why not?" Two weeks + limited laundry + international destination + weight limit = a very stressed out mama. 3) I am leaving work for two weeks. Trying not to think about all of the calls that will be waiting for me upon my return. Oy vey. 4) Ellie likes ice cream. A lot. 5) We went to get bagels and headed to Barnes and Noble yesterday! One of my favorite Sunday activities! 6) I made PW's fruit pizza this past Shabbos. It was awesome. Try it. I mean, how fun do they look? 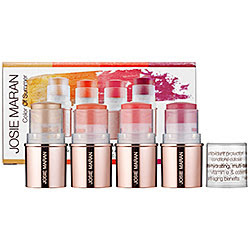 There's just something about makeup in stick form that gets me. But trying (very hard) to save money for my actual vacation. Alas. 8) I have gotten so bad at taking photos for my Project Life album. I'm glad that this far into the year, I'm still going strong. But wish I could get back on the wagon with those photos! 9) I'm 15 weeks pregnant today. Aside from a horrible story I once read about a woman who had a miscarriage at 15 weeks (that I'm still haunted by), I'm feeling good. So there you have it. A few random items from today. What randomness is going on in YOUR head today? 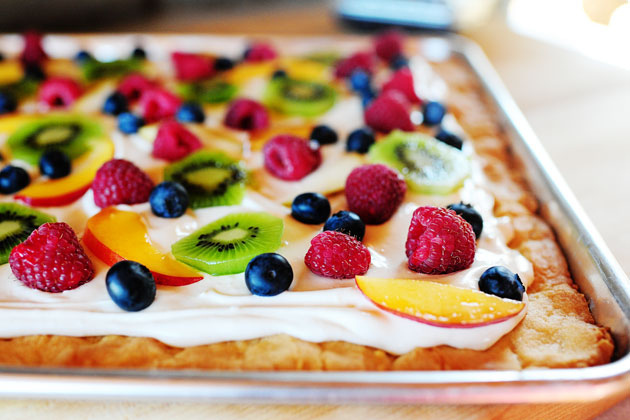 Yum...that fruit pizza looks delish! Have a great trip! we went through that with the shoe thing; then it reversed-he ONLY wanted to wear crocs (rain, snow, shine)...and I feel for ya about the packing thing even though I don't understand it; I'm one of those people who pack a week ahead of time :):) Congrats on baby #2-eat lots of fruit pizza; it is delish! Yay for baby #2! How exciting! And the Isreal trip will be amazing! I would love to go some day. Enjoy!